YOU GUYS! I have been waiting for froze for an entire year. Is it froze or frosé?! I say frosé. But I also would paint my bedroom neon pink if I had the guts so…. A year! A whole year. Remember when I made this watermelon frosé last summer? But I was pregnant with my adorable little loveable chubbanugget and couldn’t partake? 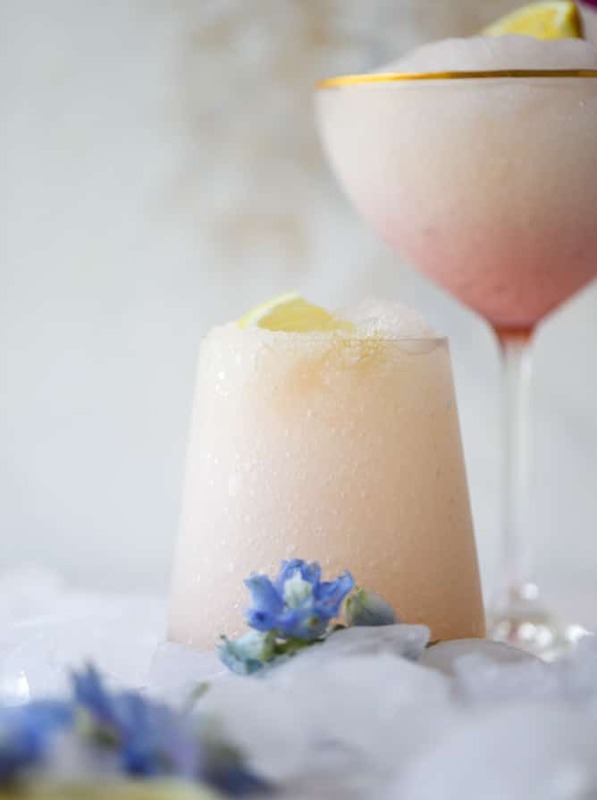 And even though people like my grandpa were all “oh you can totally have a glass of wine a day!” I could never ever do that so I made the frosé for everyone constantly and just looking longingly at the frosty, slushie heaven on a hot nights? I remember. I remember it sooooo well. I’ve been waiting all year for this day, when it’s (unofficially) summer and hot enough to have some frosé! And in this case? YES. Like how can we even stand this, it’s so perfect. 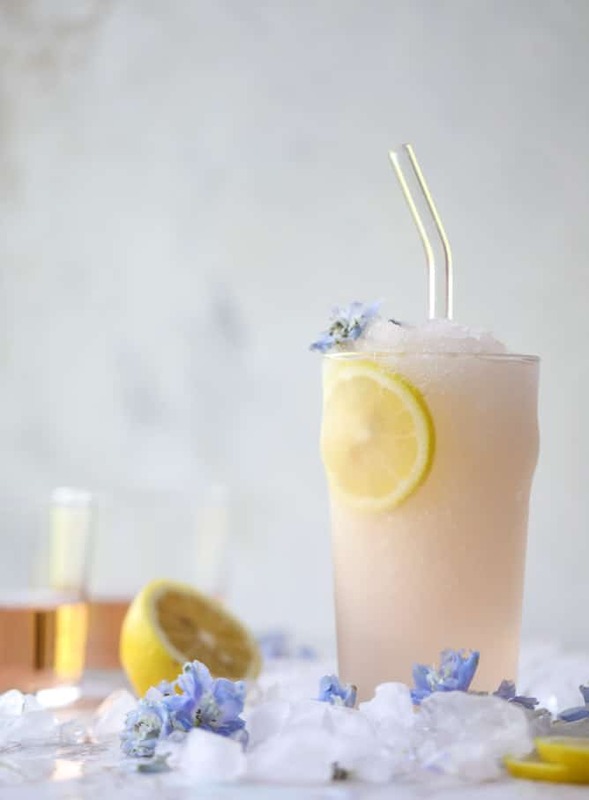 It’s basically rosé lemonade, frozen. 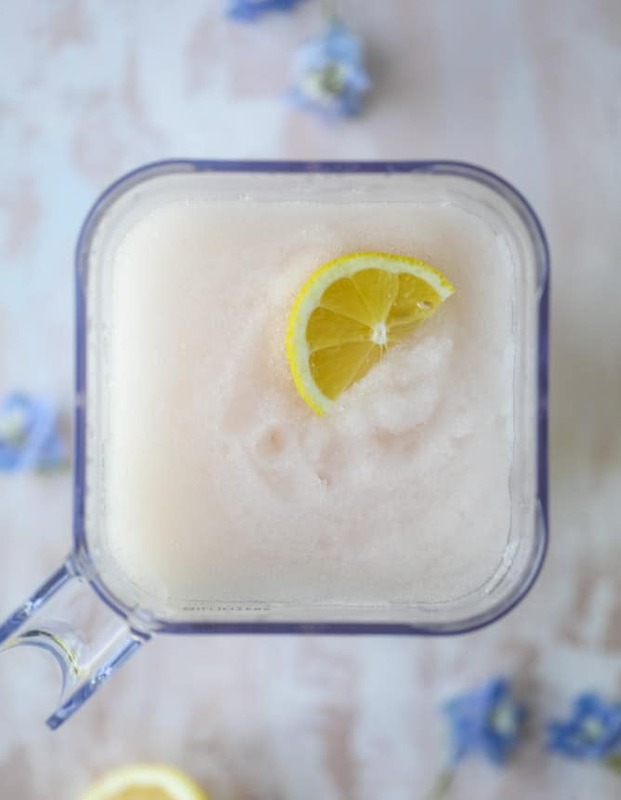 Frozen wine lemonade. I do not hate this. In fact, I love it oh-so very much. I’m just calling it. For me, after the longest winter everrrr, it’s summer. YEP. Now there is just one problem. I don’t know which one you (or I!) should make this weekend. The watermelon frosé is just dreamy because hello, it’s watermelon. 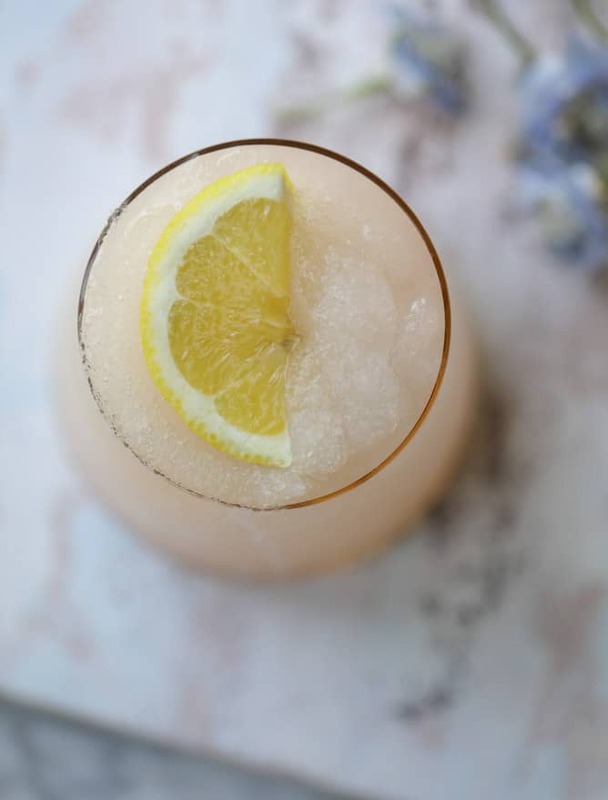 But this lemonade frosé is the perfect combination of tangy and tart and refreshing and sweet. I want to figure out how to have a permanent stash in my freezer. I guess it would be lemonade frosé granita then. Hmmmm. So when it comes to the lemonade, I say just buy it. But your favorite brand. 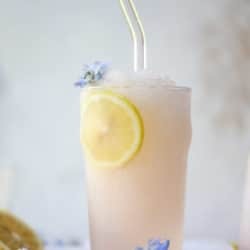 For this, I used Simply Lemonade which is the one I tend to buy if we’re having parties or something. I mean, I love to make homemade lemonade and most times, think that nothing else can beat it. But since we’re just going to whip it up with some wine, I wouldn’t go to all the trouble of juicing your lemons and all that jazz. Save that for when you want a refreshing glass of lemonade on it’s own. Not one that we’re combining with (the perfection of) rosé. And now, I just told you it’s EASY. 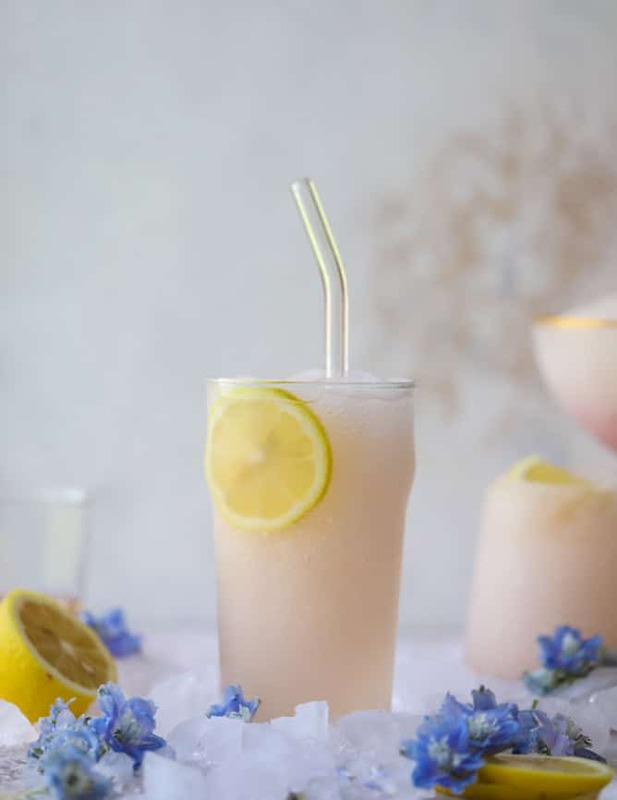 There is really no excuse, so let’s have a lemonade froze party this weekend! The night before, pour the rosé into two ice cube trays (you might need three trays depending on the size, but two should do it!) and freeze. 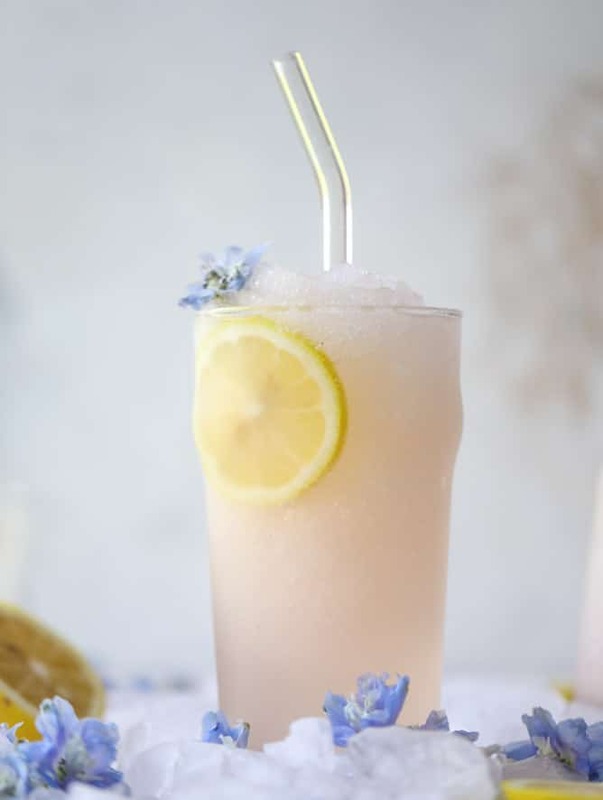 When it’s time to make the frosé, place the ice cubes, rosé syrup, lemonade and lemon zest in a blender. Blend until it’s a slushy-like consistency. I like to refrain from adding ice until I see the consistency. 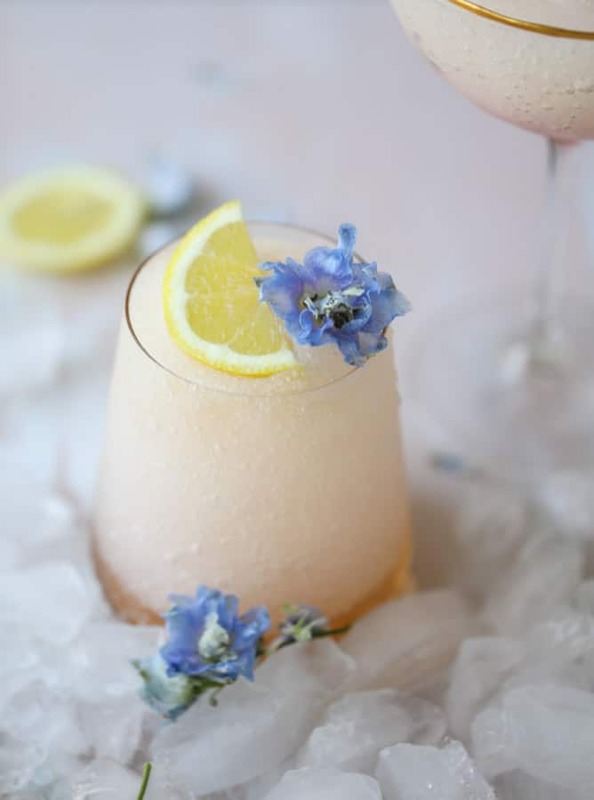 Some rosé’s freeze different, so you might need a handful or 2 of ice to make it more slushy. If it’s TOO icy and won’t blend, add more of the rosé from the bottle that you used for the syrup! Pour the froze into glasses and serve with a garnish of lemon. Combine the wine and sugar in a saucepan over medium heat. Whisk until the sugar dissolves and the mixture starts to bubble, then turn off the heat. Let it cool completely. If you made it ahead of time (you totally can! ), store it in the fridge until you're ready to use. This is the best twist on frose I’ve seen!! Okay seriously, this is kismet. I JUST bought a bottle of the new Hangar One Rosé Flavored Vodka last night and I was JUST going to google recipes to use it. And now I don’t have to! I am totally doing this with the vodka, that looks incredible and so wonderful for the weekend ahead! Thanks for sharing!! Vodka doesn’t freeze, it just becomes sluggish because of the high alcohol content. You won’t manage to make it into ice-blocks. Though I do recommend to always keep your vodka bottle in the freezer, it’s so much nicer when drinking! Giirlllll you and I are of the same mind right now. I am SO all about the rose things – AND the froze things. So dreamy! Loving the lemonade addition! What rose do you use? I seem to have a hard time finding a good dry one! but i really love minuty and la crema! Stop!! This looks too good. Now I just need some hot weather! Totally ready to frose all summer long. Thank you for this recipe! I made it yesterday for Memorial Day. It was a perfectly refreshing poolside slushy. It was also easy to make and the lemon zest was a great addition. I’ll be making it again! This looks so delicious! I am saving this recipe as a must try!